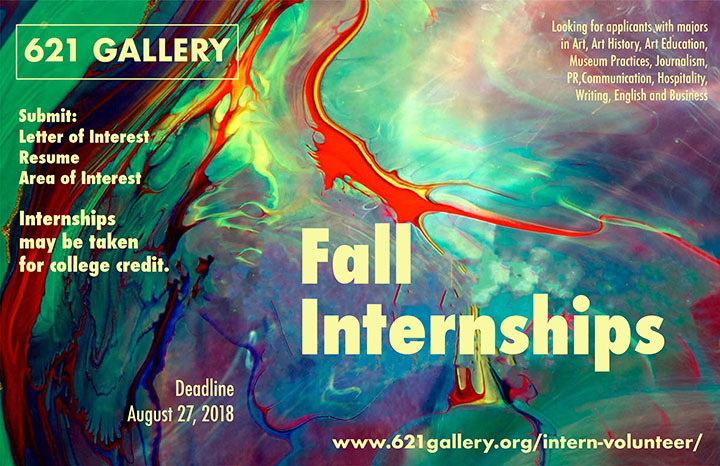 621 Gallery is now accepting internship applications for the fall semester. Undergraduate and graduate students studying art history, arts administration, dance, journalism, accounting, business administration, and hospitality are encouraged to apply. Interns will spend 15 weeks working and learning at the gallery under the supervision of the 621 Board of Directors. To apply, visit http://www.621gallery.org/intern-volunteer/. In your cover letter, please detail your academic and professional interests and outline the skills you hope to learn during the internship. Applicants will be notified via email if they are selected for an interview. Deadline to Apply: August 27, 2018.